The first headline I clicked on this morning when Haaretz arrived was the one reading “Second Temple-era Soapbox Found in City of David?” I located the IAA press release, and then a few hours later my inbox was loaded with links to various coverage of the find. 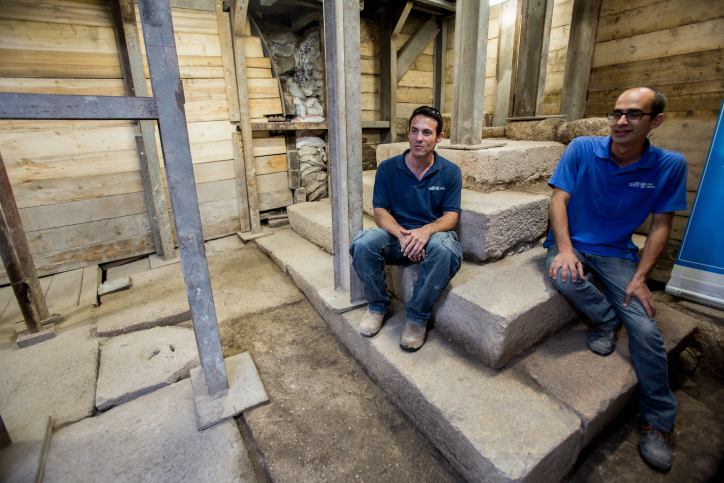 Several years ago the archaeologists working in the City of David uncovered a staircase and a drainage channel leading from the Temple Mount to the Pool of Siloam. My group was one of the first to walk through the drainage channel in May, 2010. See my report and photos here. 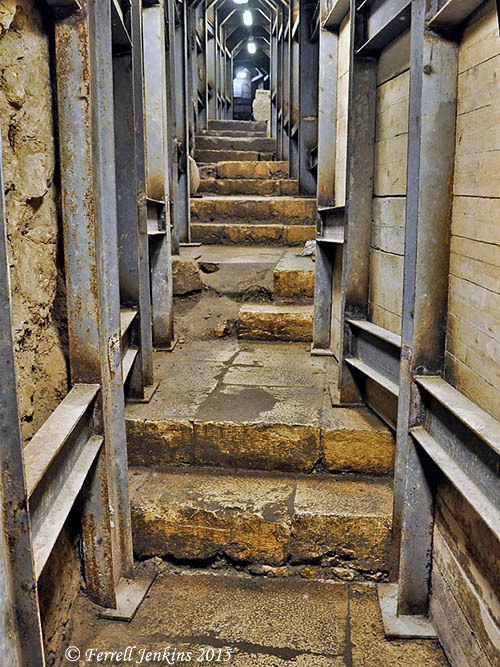 Here is a photo of the steps leading from the Pool to the Temple Mount. Steps leading from the Pool of Siloam to the Temple Mount. Photo by Ferrell Jenkins. This structure, situated alongside the 2,000 year old Second Temple stepped street, which carried pilgrims on their way from the Shiloah (Siloam) Pool to the Temple, which stood atop the Temple Mount. The street, a section of which was excavated in the past, is remarkably well-preserved and is built of enormous stone slabs. The street most likely runs above the 2,000 year old drainage channel, discovered a number of years ago, which carried rain water out of the city. It was constructed sometime in the fourth decade of the first century CE, and was one of the largest construction projects undertaken in Jerusalem during the Second Temple period. Dozens of whole pottery vessels, stone vessels and glassware were found at the foot of the pyramid-shaped staircase. Rabbinic sources speak of an “auction block” where slaves could be sold, and of a “Stone of Claims” where one who had found an item might announce it and the owner might claim it. The IAA Press release provides the references here. Dr. Joe Uziel seated on the top step of the “podium.” Photo: IAA. 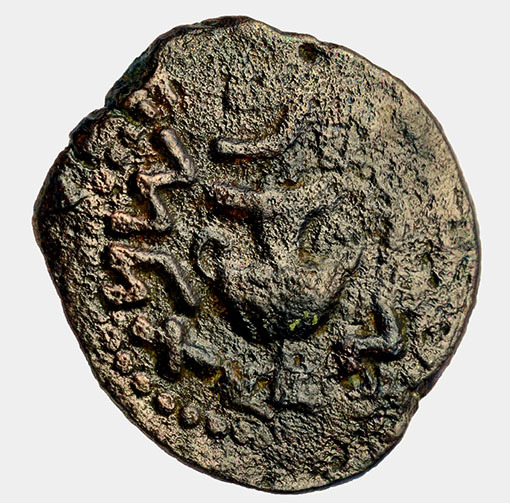 The coin below, from the Second Temple period, was found in the destruction layer atop the street. Coin from period of the Great Revolt against the Romans. Copyright Clara Amit, IAA. We had already made a possible association of these steps with the blind man who left the Temple precinct to go to the Pool of Siloam at the bidding of Jesus (John 9). A passage that now comes to my mind is from the Sermon on the Mount when Jesus teaches His disciples how to (and not to) pray. HT: Joseph I Lauer for the additional links. The rules were prepared by Anatolian State Governor Aulus Vicirius Matrialis. Here is some further information about the discovery. The excavation works, led by Pamukkale University and supported by Denizli Municipality, have continued on Stadium Street in the ancient site. 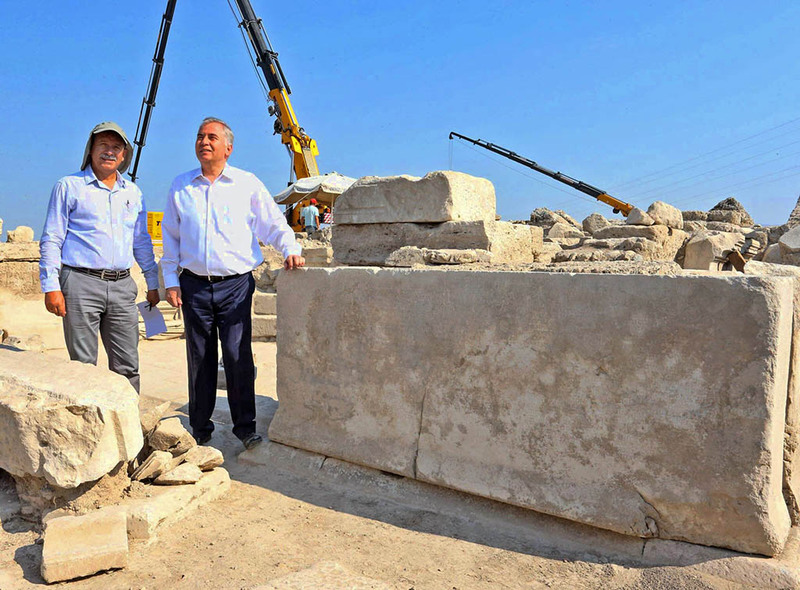 Excavations head Professor Celal Şimşek of Pamukkale University, said, “The Laodicea Assembly made this law in 114 A.D. and presented it to a pro council in Ephesus for approval. One hundred twenty-five thousand Turkish Liras amount to approximately $42,700. Fairly stiff fine. The full article is accompanied by several nice photos and will be well worth your time. Another article about the discovery appears in Ancient Origins here. 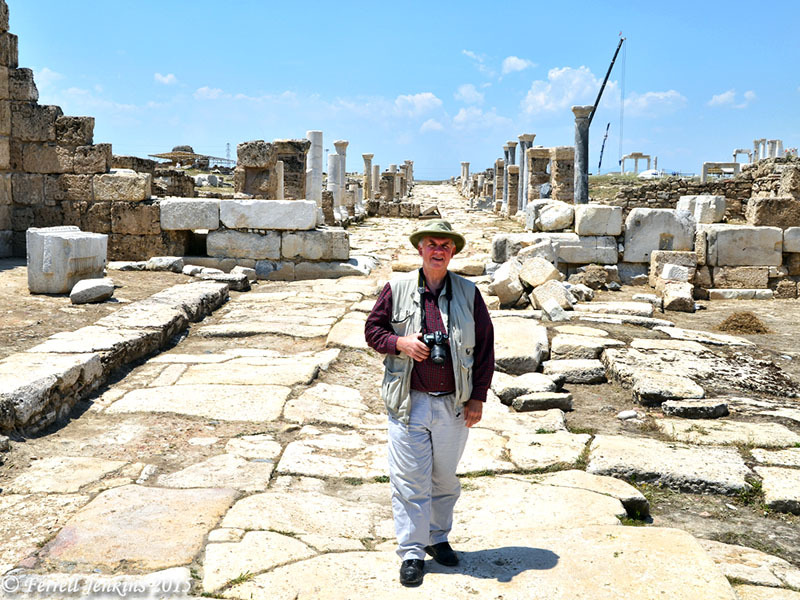 Last year my fellow-traveler Leon Mauldin and I made a personal study tour in Turkey. We had the opportunity to make a return visit to Laodicea and see the continuing excavations at the site. I think the city is destined to become one of the most popular sites in the country. Leon Mauldin on Syria Street in Laodicea. Photo by Ferrell Jenkins. Laodicea is known to us from the book of Revelation (1:11; 3:14-22), and from Paul’s epistle to the Colossians. One might easily connect this discovery to what we already knew about the water system at Laodicea. I was rather sure that I had written about the source of water and the water distribution tower, but I find only the photo of the tower here. I have written about the subject in material distributed to my tour members. Perhaps I will be able to reprint some of that material in another post. Meanwhile, I call attention to the recent good post by Carl Rasmussen about this same discovery. He includes comments about the “lukewarm” water at the Holy Land Photos’ Blog here. 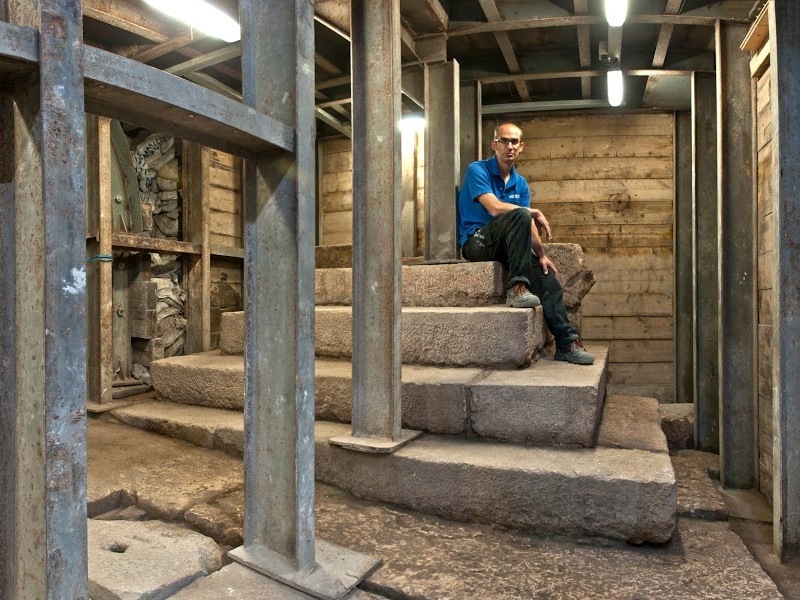 The Israel Antiquities Authority announced Wednesday the discovery of a ritual bath (mikveh, miqwe) dating to the second temple period in the Arnona quarter of Jerusalem during the construction of a nursery school. Arnona is east of the Hebron Road and north of Ramat Rahel. In the excavation an impressive ritual bath (miqwe) dating to the time of the Second Temple (first century CE) was exposed inside an underground cave. An anteroom, flanked by benches, led to the bath. A winepress was excavated alongside the ritual bath. 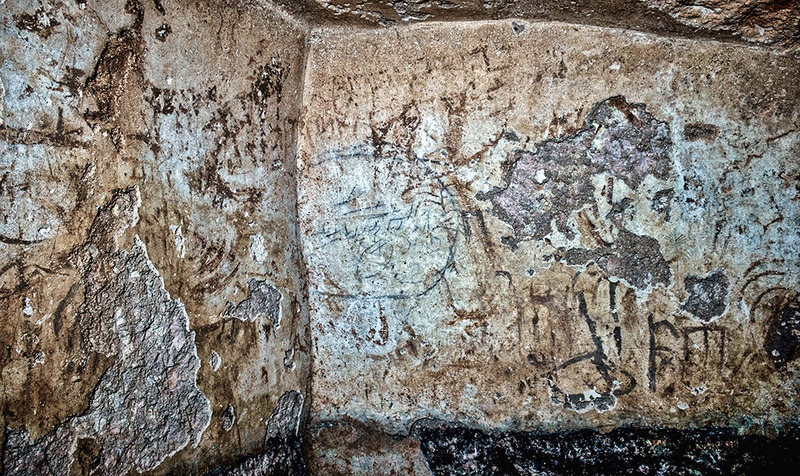 The walls of the miqwe were treated with ancient plaster and were adorned with numerous wall paintings and inscriptions, written in mud, soot and incising. The inscriptions are Aramaic and written in cursive Hebrew script, which was customary at the end of the Second Temple period. Among the symbols that are drawn are a boat, palm trees and various plant species, and possibly even a menorah. The entrance to the cave when discovered during an inspection by the Israel Antiquities Authority, prior to the construction of a neighborhood nursery school. Photo by Shai Halevy, courtesy of the IAA. Inscriptions on the walls of the ritual bath. Photo Shai Halevy, courtesy IAA. Arutz Sheva includes all of the photos provided by the IAA and their own video of the mikveh. They point out that the claim that this mikveh dates to the end of the second temple period (by A.D. 70?) is indicated by the script, pottery, and coins. Something I noticed in the IAA video that I did not see mentioned is that there are two characters depicted on the wall. In my knowledge this is not otherwise known as early as the end of the second temple period. In later centuries it became common to have humans depicted. Is it because this is not a synagogue? Comments by knowledgeable persons welcomed. Two significant New Testament references mention the Jewish rites of purification. Leen Ritmeyer reports on this discovery here and includes a couple of his drawings to help illustrate the find. Many fascinating discoveries are made as a result of various types of construction work. Keep up the good work. HT: Joseph I. Lauer and several Israeli papers. Two months ago tonight my wife and I returned from leading a tour of Alpine Europe and spending 10 days in Israel on a personal excursion. We knew before we arrived that our house had been flooded as the result of a break in the water line leading to the refrigerator. We now have new flooring. The kitchen cabinets are installed, but we must wait about two more weeks for the counter top and putting the cabinets into full use. Just this little misfortune has terribly disrupted our life; perhaps this has been reflected in the number of blogs we have posted. Breakfast of cereal and coffee is about the only meal we have been able to have consistently, and that required moving from room to room to locate the needed items. Lately we have also been able to have a sandwich and fruit in the evening. We have spent at least a dozen nights in local hotels when we have been unable to get in our bedroom or when the dirtiest work was going on. It might sound like a vacation, but it’s not. The Tampa, Florida area where I live has made the national news in the past few days because of the rains and flooding. I was just watching some of the late evening news a few minutes ago. We are barely in August, but the weatherman said we have already had more rain than the yearly average. During the first three days in August we had 8.42 inches. This is more than the monthly average. Some neighborhoods, especially those near the Gulf, the bay, or along rivers, are still under water. I feel for those folks and the length of time it will take them to get back to normal. When we made our first tour to the Bible lands in 1967, the Old City of Jerusalem and the West Bank were still part of the Hashemite Kingdom of Jordan. We crossed from Jordan into Israel through the Mandelbaum Gate. Today the Grand Court Hotel, the Olive Tree Hotel, and another hotel stand in that area. In May I walked past the Olive Tree Hotel and noticed the sign outside the hotel with the title “Weather Forecasting Olive.” I grabbed a shot with my cell phone and thought you might enjoy it. 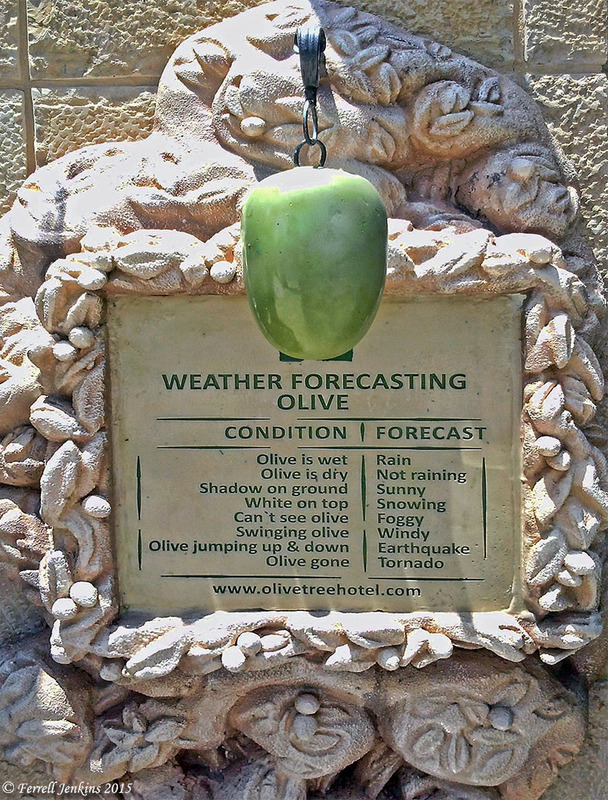 Weather forecasting olive at the Olive Tree Hotel, Jerusalem. Actually I have noticed that the shrubs in my yard provide the same forecast. Well, except for the snow. We have had one dusting in the fifty+ years we have lived here. A sign welcoming visitors to Tel Safi, now identified as Gath. Photo by Ferrell Jenkins. Gath was one of the five major cities of the Philistines (1 Samuel 6:17). The ark of the covenant was brought here by the Philistines after being capture in battle with the Israelites (1 Samuel 5:8). Goliath was from Gath (1 Samuel 17). 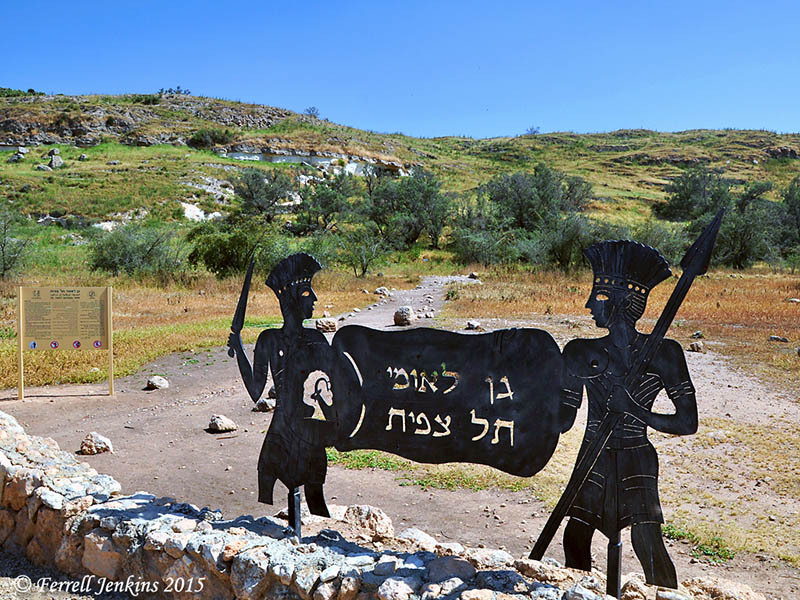 David once sought refuge from Achish king of Gath (1 Samuel 21). When Saul and Jonathan died, David did not want it to be published among the Philistines. He said, “Tell it not in Gath, Proclaim it not in the streets of Ashkelon, Or the daughters of the Philistines will rejoice, The daughters of the uncircumcised will exult” (2 Samuel 1:20). King Uzziah broke down the wall of Gath, and other Philistine cities, and built Judean cities (2 Chronicles 26:6). Gath is now identified with Tel es-Safi (or Tel Safi). 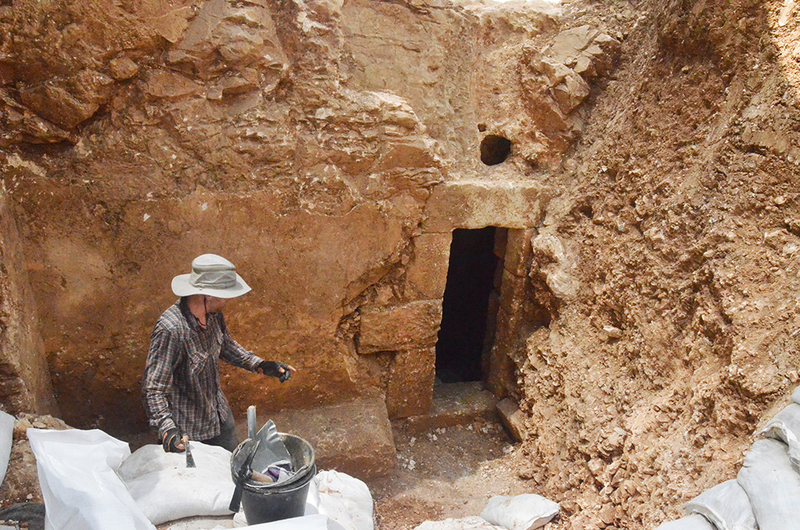 The archaeological excavation known as The Ackerman Family Bar-Ilan University Expedition is under the direction of Prof. Aren Maeir. The recent season has been an exciting one with the announcement Monday of the discovery of “fortifications and apparent gate of the lower city.” Maeir provides a list here of some of the news sources making the announcement. The Ackerman Family Bar-Ilan University Expedition to Gath, headed by Prof. Aren Maeir, has discovered the fortifications and entrance gate of the biblical city of Gath of the Philistines, home of Goliath and the largest city in the land during the 10th-9th century BCE, about the time of the “United Kingdom” of Israel and King Ahab of Israel. 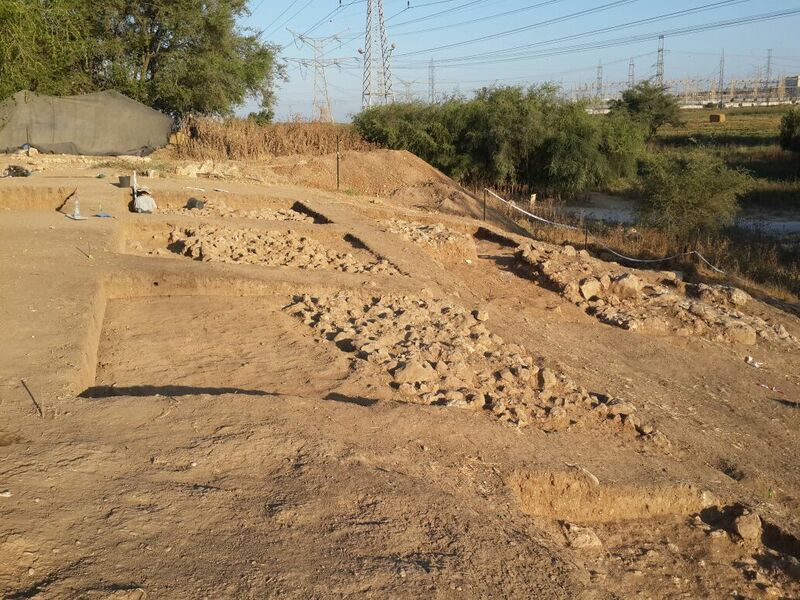 The excavations are being conducted in the Tel Zafit National Park, located in the Judean Foothills, about halfway between Jerusalem and Ashkelon in central Israel. Prof. Maeir, of the Martin (Szusz) Department of Land of Israel Studies and Archaeology, said that the city gate is among the largest ever found in Israel and is evidence of the status and influence of the city of Gath during this period. In addition to the monumental gate, an impressive fortification wall was discovered, as well as various building in its vicinity, such as a temple and an iron production facility. These features, and the city itself were destroyed by Hazael King of Aram Damascus, who besieged and destroyed the site at around 830 BCE. The city gate of Philistine Gath is referred to in the Bible (in I Samuel 21) in the story of David’s escape from King Saul to Achish, King of Gath. Now in its 20th year, the Ackerman Family Bar-Ilan University Expedition to Gath, is a long-term investigation aimed at studying the archaeology and history of one of the most important sites in Israel. 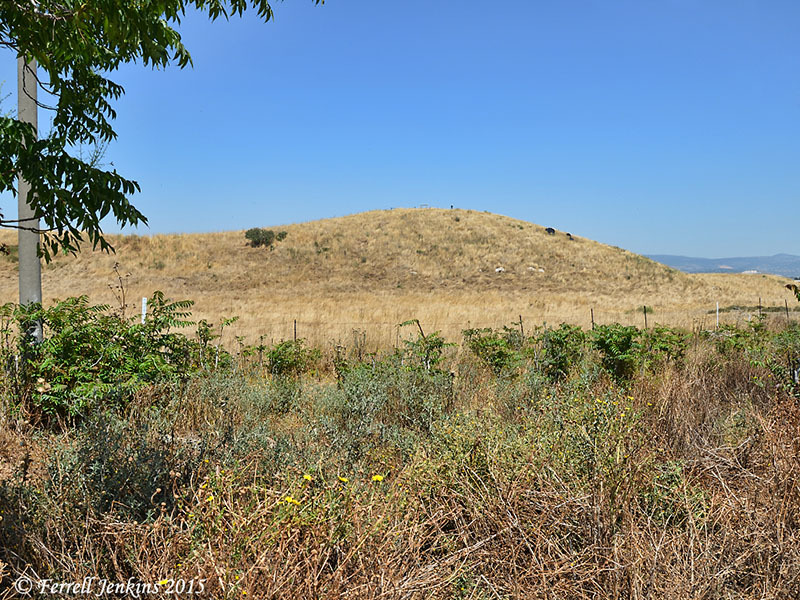 Tell es-Safi/Gath is one of the largest tells (ancient ruin mounds) in Israel and was settled almost continuously from the 5th millennium BCE until modern times. The archaeological dig is led by Prof. Maeir, along with groups from the University of Melbourne, University of Manitoba, Brigham Young University, Yeshiva University, University of Kansas, Grand Valley State University of Michigan, several Korean universities and additional institutions throughout the world. Among the most significant findings to date at the site: Philistine Temples dating to the 11th through 9th century BCE, evidence of an earthquake in the 8th century BCE possibly connected to the earthquake mentioned in the Book of Amos 1:1, the earliest decipherable Philistine inscription ever to be discovered, which contains two names similar to the name Goliath; a large assortment of objects of various types linked to Philistine culture; remains relating to the earliest siege system in the world, constructed by Hazael, King of Aram Damascus around 830 BCE, along with extensive evidence of the subsequent capture and destruction of the city by Hazael, as mentioned in Second Kings 12:18; evidence of the first Philistine settlement in Canaan (around 1200 BCE); different levels of the earlier Canaanite city of Gath; and remains of the Crusader castle “Blanche Garde” at which Richard the Lion-Hearted is known to have been. This photograph of the lower city fortifications is included with the news release. My aerial photos of Tel Safi were made in December, 2009. 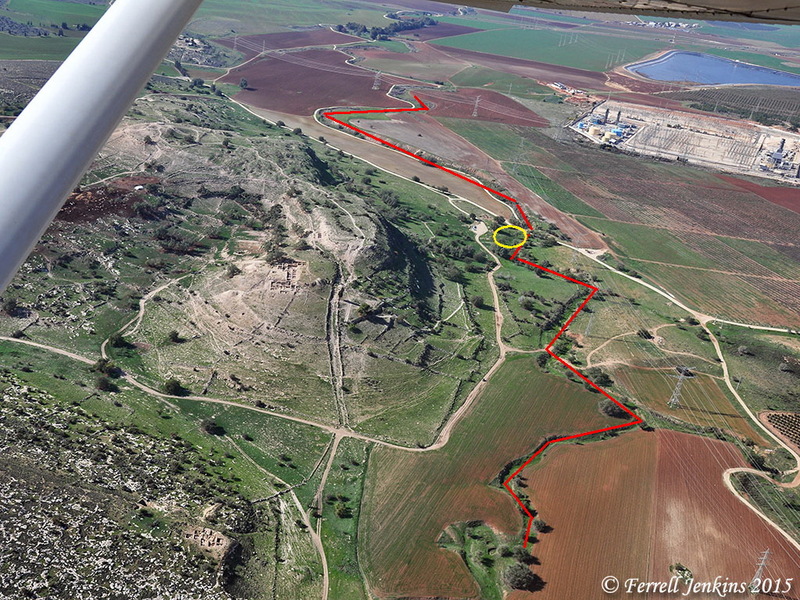 I want to point out that Gath is on the edge of the Shephelah and the beginning of the southern coastal plain which can be seen in this photo. The brook of Elah runs on the north side of the mound, then curves south and west. I have marked some of it in red. Aerial view of Tel es-Safi/Gath. Photo and markings by Ferrell Jenkins. The best I can tell from the limited photos provided, the new discovery is in the area marked by the yellow oval. Maeir has been dropping hints about this discovery on his blog for the past few weeks. On July 28th he provided an aerial photo of the “fortifications and possible city gate.” He says that “more than 30 meters of the city wall” has been traced on the surface. July 11th Maeir posted in both Hebrew and English “just for fun…what the biblical text has to say about the city gate of Gath (I Sam 21:11/10-15/14).” More about that later. I follow the Tel es-Safi/Gath expedition and have posted several articles about the site over the past few years. Today, I also give a tip of the hat to Joseph I. Lauer for the links to some of the news releases. 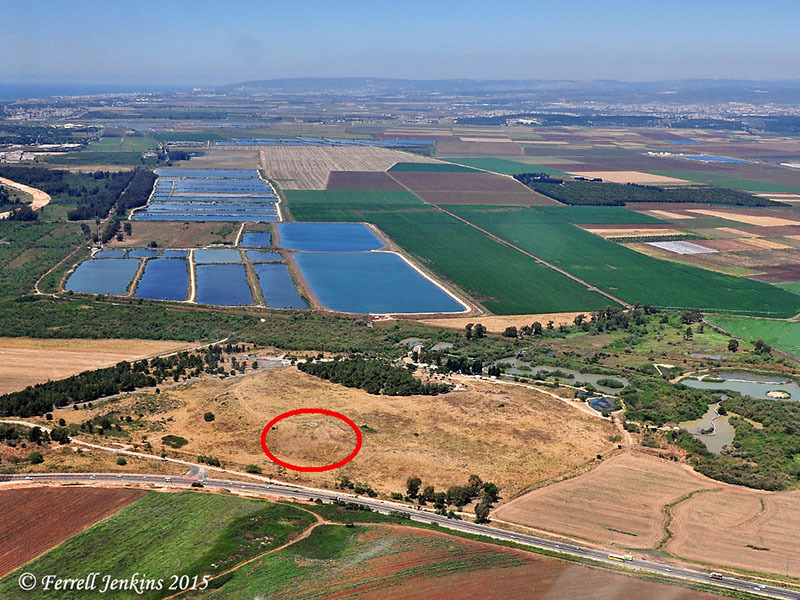 Early in the year I posted an article here about “The other Aphek – of Asher” in which I included some aerial views of the site and explained the difference between this site and the better known Aphek in Sharon. Earlier this year I made a visit to the northern site (locally spelled Afek). I will repeat one of the photos to provide some perspective.This view shows the tel, the nature reserve and the plain of Acre. The biblical tel is marked by the red oval. Aphek of Asher. View N-NE toward the Ladder of Tyre. Photo by Ferrell Jenkins. Here is a close view of the tel. Tel Aphek of Asher. View NE toward the border with Lebanon. Photo by Ferrell Jenkins. The Israel Nature and Parks Authority has a nice PDF English brochure about the Afeq Nature Reserve here. The brochure provides a brief history of the tel. A number of archaeological surveys have been carried out on Tel Afeq. They have revealed finds going back to the Canaanite period, beginning around 5,000 years ago. A row of large field stones discovered here is apparently a remnant of the most ancient city wall, dating from the Middle Bronze age (the tenth to sixth centuries BCE). During the Canaanite period a purple dye industry developed here, based on excretions from snails harvested from the sea. Glass was also produced here using sand from the beach at Acre and the surrounding area. Both these industries made the area very important economically. In a salvage dig in May 1998 at the northern edge of the tell, human remains were found, along with pottery vessels and tombs from the Middle and Late Bronze ages (19th-13th centuries BCE). Bible Walks has many photos, historical references, and a Google earth map with identifications here. If you choose to enjoy the whole area you will need a few hours.